Knowing about the engine working is a fun especially for non-engineering people. You might have an automobile in your home. It may be a car, moped, motorbike or anything else. Have you ever thought how an engine works? You may have a diesel engine or petrol engine that doesn’t matter. Will you know anything about engine working? If not, here is the right place to gain some information. If you don’t have bachelor’s degree in mechanical engineering still you can easily understand the working of four-stroke cycle engine. You just have to read the full article. So, what is the difference between a 2 stroke and a 4 stroke engine working? When only two strokes required for completing the reciprocating engine cycle then that engine is known as a two-stroke engine. And when four strokes required for completing the cycle then it is known as a four-stroke engine. Actually, two strokes or four strokes are the cycles of any reciprocating engine. This applies to all internal combustion engine and also steam engine. In the four-stroke engine, the work is obtained only during one stroke out of these strokes for a single cylinder engine or for every cylinder individually for the multi-cylinder engine. Here in this article, I will like to share detail information on four-stroke petrol engine working. This is the first stroke of your engine. During this stroke, the piston is moved downward from Top Dead Center by means of the crankshaft which is rotated by an electric motor. This movement increases the size of combustion space thereby reducing the pressure inside the cylinder, as the result, the higher pressure of the outside atmosphere forces the air into combustion space through suction valve. The exhaust valve remains closed during this engine working stroke. A carburettor is put in the passage of incoming air which supplies a controlled quantity of fuel to this air. This air-fuel mixture thus comes in the engine cylinder. This is the second stroke of your engine. The air-fuel mixture is compressed during this upward stroke. The compression forces the fuel into closer combination with air. Heat is produced due to compression aids the combustion of fuel. Just a little before the end of compression stroke the mixture is ignited by a spark produced by a spark plug. During this engine working stroke, suction and exhaust valve remain closed. This is the third stroke of your engine. You may call it as Expansion Stroke also. The air-fuel mixture which burns at the end of compression stroke expands due to the heat of combustion. 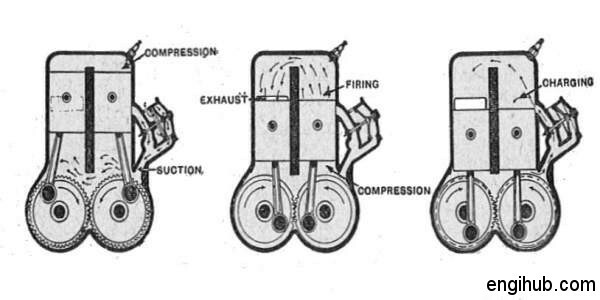 This expansion of burnt air-fuel mixture exerts pressure in the cylinder and on the piston, and under this impulse, the piston moves downward thus doing useful work. Suction and exhaust valve remain closed during this engine working stroke. This is the last stroke of your engine. During this stroke, the suction valve remains closed while the exhaust valve opens. The greater part of burnt gases escapes because of their own expansion. The upward movement of piston pushes the remaining gases out of the open exhaust valve. Thus complete the exhaust stroke and one working cycle of the engine. A number of cycles are depending on the rotation per minute of your engine. Higher the R.P.M., higher the work done carried out by the engine.